Now in its 23rd year, The GC50 Run Festival has been an annual event since its inception in 1997. Its breathtaking coastal course has seen the event be on the bucket list for many ultra-runners around Australia over the years. 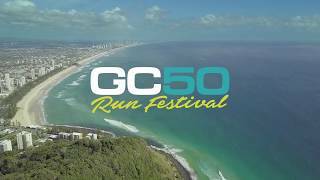 In 2017 the event was re-branded to The GC50 Run Festival, with the event offering a range of distances to suit all fitness abilities and backgrounds. Following the sell-out 2018 event, be sure to register early for the 2019 GC50 Run Festival to avoid disappointment. Entries will open mid-March 2019. The 50 kilometre, 30 kilometre, 15 kilometre and 5 kilometre events that make up the Gold Coast 50 Run Festival use the footpaths and roads adjacent to the Gold Coast beachfront, home of the world’s most attractive beaches. Running from Kurrawa to Coolangatta and return, the course provides athletes with spectacular views, regular water stops and aid stations. Ideally positioned in the calendar to end the year on a high and conquer another challenge before the year is out - Don’t miss out on running this stunningly beautiful run course this December. All participants receive a finisher medal, technical running singlet, two month subscription to Runner's World, plus plenty more!